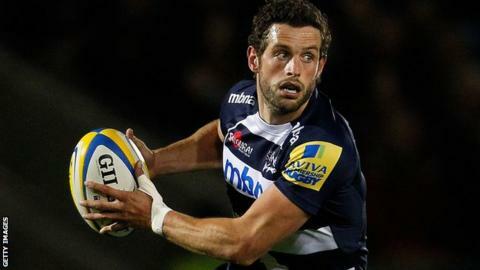 Fly-half Nick Macleod and prop Ross Harrison have signed new contracts with Premiership side Sale Sharks. Macleod, 30, has agreed a two-year deal, while 21-year-old Harrison has signed on for three more years. And the Sharks are hopeful of announcing more contract renewals in the next few weeks. Steve Diamond's side, who are seventh in the table with four wins for their first eight Premiership fixtures, travel to leaders Saracens on Saturday. Highly-rated front-rower Harrison has been involved in every league game for Sale this season. Macleod began the campaign at fly-half but suffered an arm injury in a and subsequently lost his place to Danny Cipriani, although Macleod did appear in both of Sale's games in the LV= Cup. "Nick is a model professional who has been at the club for five years now and he's a great player at number 10," Diamond told the club website. "He's a really popular guy with all of the squad and he's does a good job whenever he plays. "We see a massive future for Ross. He's definitely got a full representative future with England ahead of him if he carries on the way he's going."